elcome to The Motor Pool. If you're a first-time visitor to our site, we would greatly appreciate it if you could read this entire section first before placing an order with us. It answers a great many questions that might arise during your stay here and hopefully improves the bond that likely occurs between a vendor and would-be customer. Our objective is to make you a repeat customer, so its important we go over some of the ground rules first to put everyone at ease. As a first time visitor to our web site, we strongly recommend that you create a customer account by clicking on the "My Account" link, which is located in the upper left hand corner of our home page. You will then be prompted to enter your email address and a password, followed by your pertinent billing and shipping information. Be advised that we do not share this information with any other organization, business, or advertiser. If you have any further questions or concerns, feel free to communicate with us directly by visiting our Contact Us page. By creating an account, you can immediately determine how much shipping charges will be to your location, particularly if you live outside the US. To determine the shipping costs, simply place the items you'd like to purchase into your shopping cart, then click on the shipping box at checkout to determine the charges for each means of delivery. Please note that we do not provide individualized shipping quotes, particularly for international orders. Prospective customers must create an account to determine shipping costs. Once you have created an account with us, you'll be able to perform a wide variety of functions. As can be seen in the accompanying diagram, you can review / track orders that have been shipped, change your billing and shipping addresses, and print an invoice. The editing function for previously placed orders has been disabled due to credit card authorization issues, so customers must contact us to amend an order. You can write a review for a product you received, check your gift certificate balance, and edit your Wish List. While you can edit your credit card information, this does not mean that an old order will automatically receive a new authorization code. This must be handled by our administrative staff or can be achieved by placing a new order. When you visit our site, all of our products are first shown as encapsulated listings complete with thumbnail images. To see a larger image of the item and view a more detailed description, simply click on the thumbnail image, the product listing's header, or the "More Info" button situated at the end of the short description (see yellow highlighted regions). Please note that in the case of items yet to be released by a manufacturer, the anticipated ship date is noted at the end of the item's complete description. Since these are collectibles, oftentimes affected by market conditions, ship dates have been known to change on a routine basis. We apologize for any shipping delays, but keep in mind we have no control over the release dates for these items. What do you think when you hear the words, "sold out"? For us, it can mean several things, depending upon the item in question, who makes it, and timeframe. In general, we use the words "sold out" to define a product's status when we are out of the item. It can mean that the same item is available elsewhere, perhaps from the manufacturer and quite possibly from another vendor. By the same token, a "sold out" item can be reintroduced to our product portfolio if we manage to find stock elsewhere or the manufacturer has brought back the item by popular demand. So, it always pays to ask if you're interested in a particular item that may be noted as being "sold out" cause its quite possible we can obtain more of it under the right set of circumstances. From time to time, you may also run into the phrase "Original Issue Price" located within a product listing. Essentially, this represents the issue price for the item in question when it was first made available. As supplies dwindle and demand for it continues to soar, the selling price goes up reflecting its enhanced market value. Using our shopping cart is a straightforward process. Everytime you click on the "Add to Cart" button from a product listing, your shopping cart will fill up with items. A small thumbnail image of the item will appear on the left hand side, followed by a short description, the quantity and the extended price. Each time we run a sale, we will list a coupon code such as "TMP036". This code must be entered into the Coupon Code field found at the bottom left hand corner of the shopping cart. If it has been entered correctly, you will see the discount applied at the bottom of the shopping cart. 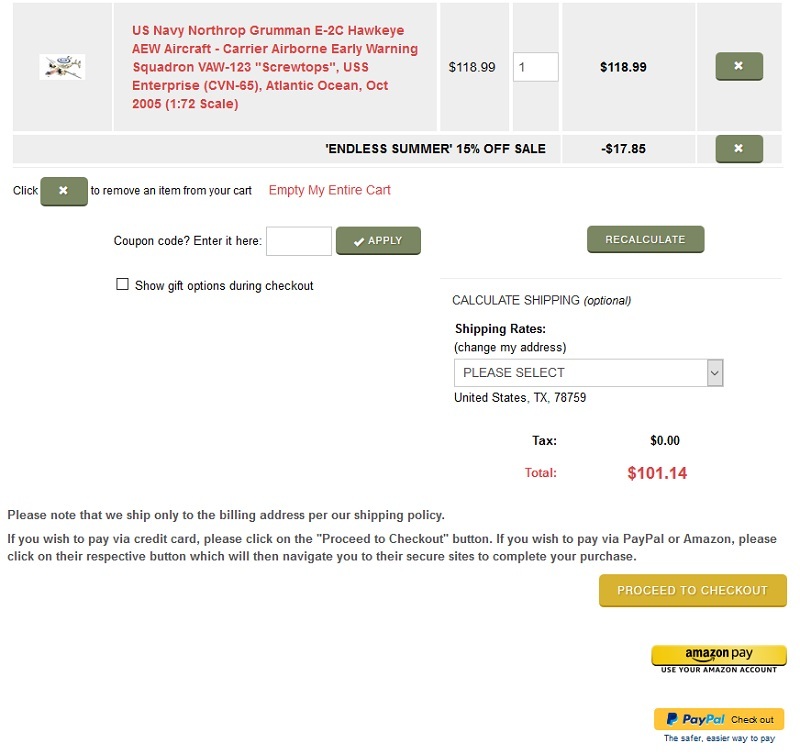 In the example below, a customer has entered the correct coupon code and is receiving a 15% off July 4th discount. On the bottom right hand side of the cart, you will see the Calculate Shipping Rates section, which shows the cost to ship this parcel based upon the destination, method of delivery, and weight of the order. Finally, below the shipping methods box, you will find our log in section. At this point, you must enter the email address and password you created when you first opened an account with us. If you wish to pay by either PayPal or through Amazon's secure wallet (Amazon Pay), click on either of the yellow buttons on the bottom right hand portion of this screen rather than proceeding to final checkout through our secure payment system. Every so often we run special sales that involve the use of coupon codes to reap greater savings. When a sale is announced, we will list a coupon code, such as "TMP036", which must be entered into the coupon code field at checkout. When multiple sales are running concurrently, these coupon codes will typically not work in conjunction with one another, thereby negating the effect of cumulative discounts. Under special circumstances, we will allow these discounts to be combined and will say so in any promotional literature. Keep in mind that in certain circumstances sales involving coupon codes may not apply to pre-ordered, back ordered or special order merchandise. Please do not enter the coupon code if the item falls into these categories. We will cancel the order and ask that you re-enter the order with these guidelines in mind. What's a pre-order? A pre-order is an order placed by a customer for an item(s) that has yet to be released by the manufacturer. Unlike some retail operations, we DO NOT charge a customer when they place a pre-order with us. The customer will only be charged for an item when it is ready to be shipped out. If another retail operation is charging you at the time you place your order, you should ask them why because this is highly frowned upon by the financial community. We also strongly recommend that you use a credit card to place a pre-order with us as opposed to a debit card or PayPal. If you opt to use a debit card, then the amount of the transaction is frozen in your account for a period of time, usually 30 days, and you will not be able to use these funds for other means. Likewise, if you decide to send us funds by PayPal for a pre-ordered item(s), then you are, in effect, sending us your funds prior to us being able to send you the item(s) in question. We also strongly recommend that when you place orders with us that you segregate your orders by keeping pre-orders on one order and orders calling for in-stock merchandise on another. This will lead to faster ship times and lessen the amount of confusion that can result from an order calling for both pre-ordered and in-stock merchandise. We do not accept contingency-based orders. A contingency-based order is one where a customer "promises" to pay you once an item arrives and attempts to submit an order calling for payment by money order or check. If you wish to pre-order an item(s) we need your payment up-front in the form of PayPal or you must supply us with your credit card information so that we can process your order once the merchandise arrives. Why pre-order an item when you can just as easily wait until it comes in to place your order? Two reasons. First off, there's no way of knowing that when the merchandise does come in, there will be enough on hand for general sales once we've filled our pre-order list. Second, we stand behind the pre-order price of every item, even when a manufacturer decides to increase its price by as much as 25%. Here's one recent example where it paid to pre-order. Last year, 21st Century Toys indicated they were going to offer a 1:18 scale German 88mm FlaK gun. At the time, the manufacturer was selling a full range of 1:18 scale diecast military vehicles, most of which were priced at around $39.99. Based upon some preliminary information, we assumed that the Flak gun would sell for $49.99, seing as how it had more parts and wholesale costs were starting to rise, albeit negligibly. Well, our overzealous early listing turned out great for our customers but not so sweet for us. The manufacturer raised the wholesale cost for this item substantially, which meant we were actually losing money on each '88' going out the door. Needless to say, we still honored the pre-order price for this item when it shipped in November and have raised its selling price to a higher level to compensate for the higher costs. The moral of the story? You really have nothing to lose by pre-ordering from us and everything to gain. When you place an order with us, it immediately goes into a queue and its status is noted as "processing" by our order fulfillment system. This means several things. First the order has not yet been reviewed by our staff for possible inaccuracies and/or conflicts of interest. It can also mean that the order cannot be filled by our staff, since the order may call for items that have been back ordered, must be special ordered, or not yet released by the manufacturer. The order status will change to "shipped" when we have filled the order and prepared the merchandise for transfer to one of our carriers. Keep in mind that it could take several hours or even a few days before the merchandise is actually handed off to a carrier and shows up in their system. For example, we could process an order on a Friday night after UPS has already made their daily pickup but the tracking number may not actually show up in their system until the following Tuesday, if Monday is a holiday. Our web hosting solution is currently incapable of sending out periodic "status" emails, even though we recognize this would be a terrific feature. As such, it is important that you log onto our web site every so often to see what you have on back order to avoid duplications or pricing discrepancies that can arise from manufacturers adjusting the cost for an item after it has been announced. Be advised that if you are paying by credit card, we are no longer shipping to any address other than the billing address provided. Should you enter a different address, we will revise the order to reflect this update to our shipping policy. We will ship to an alternate address if you pay by money order. Shipping costs do not cover any customs fees or VAT your country may impose upon the receipt of overseas packages. This cost is your responsibility. If you would like to pay via PayPal, please place the items in question in your shopping cart then click on the yellow "Checkout with PayPal" button located at the bottom of the shopping cart. Similarly, if you would like to pay via Amazon's payment system, click on the yellow "Amazon Pay" button (a.k.a. Amazon Pay beginning Feb. 1st) also located at the bottom of the shopping cart. Bear in mind that both PayPal and Amazon Pay are handled in the same manner - both payment methods will transfer funds to process the transaction at the moment the transaction is completed and not necessarily when the shipment is made. Did you remember to keep in stock merchandise on one order and other items (pre-orders, special orders, back orders) on a separate order so we can expedite shipping? Keep in mind that UPS does not deliver to a PO Box nor can it be used to ship to an AE, AP or overseas address. By proceeding to checkout, you are acknowledging that you have read and understand the First Time User Information section found on our website. As many of you can probably attest, we're big on systems management, which is one key reason why we can perform a multitude of tasks other companies might require an army of laborers to handle. When it comes to shipping, our order fulfillment system is tied in to both the United States Postal System (USPS) as well as United Parcel Service (UPS). In either instance, our system is pulling live rates (known as APIs) from each carrier, based upon the weight of the parcel, the point of origin and its destination. As a result, its conceivable that shipping rates can rise and fall periodically throughout the year, based upon the rates being passed along to us by both carriers. Please do not contact us directly to ask about shipping costs. Email inquiries usually result in a flurry of back-and-forth emails that prove counterproductive for all parties concerned. To determine shipping costs, simply place the items you would like to order in your shopping cart then enter your shipping address. A list of shipping options will appear along with their associated costs. You may freely cancel an order placed with us prior to it being shipped out to you or the intended recipient. Orders may not be cancelled after an order has been filled and is already en route to you or the intended recipient. If you wish to return an order that has already been processed for shipment, you must first contact us to obtain a return authorization. Any return shipping costs are born by the customer even if the order called for free UPS ground shipping. Keep in mind that placing then cancelling orders with us should not be done on a care-free basis. If you are unsure about ordering an item, we would prefer that you not order it until you are 100% positive that you would like to purchase it. We are not a shop-at-home service nor do we relish the idea of processing returns on a day-to-day basis, particularly when this policy has been explained in detail and other orders need to be filled. Returned items are subject to a 15% restock fee and must be returned in salable condition. It pays to go with MyRewards. Every time you make a purchase with The Motor Pool, you'll receive points for the product(s) you purchase based on your total purchase amount. It's a great way to save on your next purchase whether it's for you or someone special. For further details, please consult our My Rewards page, accessible through the left hand nav menu. In order to remain PCI Compliant, our web hosting solution recently prevented all of its merchants from "seeing" any credit card information submitted by customers when placing their orders online. Essentially, this is an added layer of security designed to protect customers from potential hijacking of their credit card information for fraudulent purposes. For those of you unfamiliar with PCI the acronym stands for The Payment Card Industry Data Security Standard (PCI DSS), which is an information security standard for organizations that handle cardholder information for the major debit, credit, prepaid, e-purse, ATM, and POS cards. Defined by the Payment Card Industry Security Standards Council, the standard was created to increase controls around cardholder data to reduce credit card fraud via its exposure. Validation of compliance is done annually by an external Qualified Security Assessor (QSA) for organizations handling large volumes of transactions, or by Self-Assessment Questionnaire (SAQ) for companies handling smaller volumes. For us, it creates a bit of a problem for orders filled outside the original thirty (30) day authorization period because it now requires us to contact the customer to retrieve their complete credit information so that the order can be reauthorized. Keep in mind that this protocol affects ALL merchants uniformly, so do not be alarmed if we have to contact you to review your information with you. The same practice should be conducted by other online retailers. In the first of our series of articles discussing the diecast industry at large and the part we play in it, we thought it would be a good idea to discuss product release dates and some of the criteria used to determine them. To begin with, we at The Motor Pool would love to be able to peer into a crystal ball and determine, with the utmost certainty, the release date for every product we carry right down to the actual date of delivery. The truth of the matter is its impossible to predict when an item will come out for any number of reasons. If the item is a heavily requested product, such as a 1:72 scale Dragon or Hobby Master tank, it can take us several days to review and process all of our orders and put all the shipments in the mail. Here again, we simply don't press a button and out pops 100 ready made boxes all set for shipment. This step in the process can take awhile if we need to contact the customer to review their billing information with them. To sum it all up, everyone along the supply chain is doing their utmost to bring the product to market in a timely manner. Unfortunately, there are far too many things to take into account which can and oftentimes do lead to delays in getting the product to your door. We hope you understand all of the obstacles that need to be hurdled each time a new item comes out and certainly appreciate your patience when you place your orders and wait for your deliveries. We accept pre-orders for many of the products we carry and oftentimes make these items available at prices that are lower than our standard selling price. Essentially, we are trading some of our profit margin for a better means of forecasting how much stock to bring in. Obviously, this process has its advantages and drawbacks. One the plus side, its helps to keep our inventory in line so we dont have to run fire sales. On the flip side, many of our customers tend to place orders with us for an entire series in an effort to obtain these items the moment they come out. The problem we face as a retailer is that the manufacturer usually spreads out the release of their products over many months, and in some instances, over the course of years (yes, you heard correctly). Some customers are under the impression that we will hold their shipment until the very last item on their order comes in so they can reduce shipping charges and fill their order in one shipment. In a perfect world this strategy makes sense, however, from our perspective we simply cannot hold orders indefinitely. We make every effort to consolidate shipments to reduce shipping charges but the fact of the matter remains that we do not have the warehouse space to hold merchandise for customers for weeks or even months on end. Furthermore, we still have to pay the manufacturer for their merchandise, whether or not we have it shipped it to our own customers. What ends up happening is that we are forced to ship larger orders to our customers piecemeal, based upon the receipt of each item on their order. We recognize that the customer must then foot the shipping bill for each partial shipment and frankly there isnt much we can do about it. Its one of the foibles that go along with placing orders online as opposed to walking into a brick-and-mortar store. If this isnt your cup of tea then there really isnt much we can suggest other than to try another retailer and see how they address these situations. Article #3: Ready, Set, Charge It! Most of our customers would prefer to use charge cards as a means of paying for their purchases. We have no problem accepting charge cards, however, there are a few things we'd like to point out that'll help make the process more transparent and simpler to understand for all parties concerned. For starters, charge card sales are actually a two-step process. When you submit an order online or call in a charge card order, we must transmit your billing details to our credit card processor to obtain an authorization. At this point nothing is being charged to you, the customer, nor has any funds changed hands. We are simply verifying that the customer has the necessary funds available should we need to finalize the sale within a specified period of time and double-checking with them that the information you have provided us matches the information they have on file for you. This process is similar to the way in which the lodging industry accepts new guests. They ask for your credit card then run it through to see if you have the necessary funds available to pay for your stay. Once we are ready to ship you your merchandise, we will execute the sale ("capturing funds"). At this point, you are now being charged for the merchandise we are sending you and this dollar amount will appear on your next billing cycle. Debit cards are approached differently by credit card authorizing agencies. Once an order is submitted, that dollar amount is then frozen in the customer's bank account and cannot be used for any other purchases. So, even though the item(s) in question may not be available for shipping at the time the order is placed, the customer is essentially paying for the goods up front, much like PayPal. If this arrangement is problematic, we strongly recommend using a credit card instead of a debit card to consummate the sale, since nothing is being taken out of your bank account and nothing is being charged to your credit card account. In regard to credit card sales, the initial authorization we receive from the credit card company is only good for a specified period of time, usually 30-45 days after the order was submitted. Afterwards, the merchant must obtain a new authorization to complete the sale, which is why we sometimes must contact the customer to review their billing information with them all over again. Its a cumbersome process, but one that is designed to protect both the customer and merchant from fraudulent activity. We've come a long way in eightteen years, and we can only imagine where we'll be eleven years hence. Obviously we've grown over the years in terms of selection, inventory and customer base. While some e-tailers aspire to get bigger, there comes with it a bit of a challenge that seems to getter tougher with each passing day. For openers, its oftentimes harder for us to respond to questions as quickly as we'd like, particularly in the case of our Frequent Shopper Program and product availability. With nearly 6,000 products to choose from, and more new items added daily, it becomes harder for us to keep track of every release date or remember the status of each and every item. It also means that key items sell out faster, as more and more customers vie to purchase the same limited supply items. This means that we may have to check with our suppliers sooner than we would ordinarily like to see if they have additional stock on hand. Getting bigger also means more paperwork to push, product to handle, cartons to pack and shipments to make. Sometimes it feels as if we're working non-stop from dawn until dusk to ensure we've addressed as many issues as possible. The grim reality is that we're not looking to get much larger than where we're already at, so that we can still provide the same level of customer care and support everyone has grown accustomed to over the last few years. So, we'd appreciate it if you could keep all this in mind the next time you contact us to inquire about that which is already explained on our site. By taking us away from some of the more critical aspects of our business, we tend to get backed up more quickly, which obviously does no one any good. You may have noticed that the design philosophy for this site is different than most. While we certainly respect our competition and admire the success they've achieved, our aim has been and will continue to be charted along different lines. Put simply, we want to set ourselves apart from the pack, by offering more in-depth content, loftier artistic license, and an immersive historical backdrop, which are all designed to give the shopper a more inviting venue and hopefully a greater appreciation for the items they're considering for purchase. 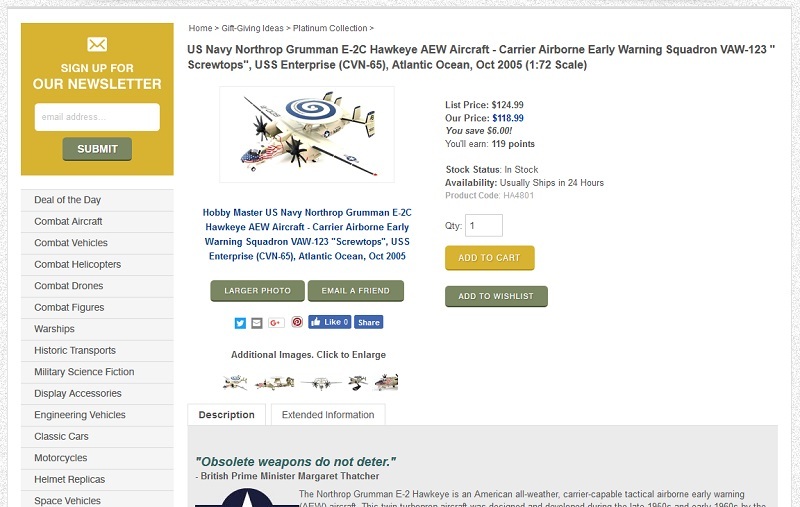 As we see it, the customer is purchasing a piece of history, so its important they understand each item's place in the field of combat and its heraldry, along with what the average soldier, sailor, airmen, etc. had to endure to play his part on the international stage. We also strive to provide a more insightful news department, one which is built from the ground up to offer up-to-the-minute updates on the latest comings and going in the markets we serve. While this may, on occasion, cause a few headaches for some, we believe that accurate news gathering and dissemination amongst our customers is of paramount importance, especially since they are opening their wallets and voting with their hard-earned money. Some customers have even been known to change a standing order after learning that a more intriguing option might now be available. While this high brow approach may not be understood by all, we believe the job of the e-tailer in today's virtual marketplace is to bring together as much assets as possible so that the consumer can make an informed decision about their present and future purchases. Anyone can tack up a photo of an item, scribble down some verbage, then put up their price. However, as the consumer becomes ever more savvy, we believe they're looking for as many details as possible before deciding upon which items to purchase and from whom. From time to time, we get calls or emails indicating that the customer received a defective item. Obviously, we're sorry to hear about the problem and wish it never occurred. Unfortunately, these things do occur and, quite frankly, will continue to crop up due to the nature of the business we're in and the selling venue we choose to operate in. For starters, we're shipping fully assembled models that will always run the risk of getting damaged in transit. We can do our utmost to protect an item but that doesn't guarantee that the carrier wont decide to play football with the parcel or mishandle the carton during any stage of delivery. Furthermore, there's no way for us to inspect each and every item prior to shipping, especially mass market produced items that may be tied down and cocooned in shoplifter proof packages. Even if we did have the time to pull each item out of its original packaging, someone would then come along and ask us why they were shipped an item in a package that was obviously opened. As you can see, its a lose-lose proposition for the vendor. In these circumstances, we believe the best course of action is to simply take back the item and either ship out a replacement at our cost or offer a refund less the shipping charges. We do not refund shipping charges since this is a cost of doing business online for both the vendor and the customer. To put it in proper perspective, would you walk into a deep discount merchant and demand that they reimburse you your gas money anytime you had to return an item? Again, this is one of the collateral costs associated with purchasing products online that no one likes to hear but one which needs to be addressed nonetheless. Effective immediately, any order for customized products must be paid for in full at the time the order is placed, without exception. Obviously, if the item is in stock, then it will be shipped out the next business day and the transaction will be completed. If, however, an order is being placed for an item that is not in stock, it may mean having to wait as much as ninety (90) days before the customer can take receipt of the item. We've decided to change our policy due to some recent unfortunate incidents. As a result, we thought it made sense to explain what goes in to the customization process, at least from our end, so that you can better understand what is involved. For starters, it means we have to purchase additional product from the manufacturer over and above what we plan to sell. It also means we have to pay to transport the goods from our location to the customizer's location, which is clear across the other side of the country from us. Now, these are heavy items that need to be shipped in groupings rather than as individual pieces to cut down on shipping expenses. Having said that, it also means we have to pay the customizer for his services. Recently, we've had an incident where a customer was no longer interested in completing their purchase, after we had gone through a lot of effort, energy and cost to bring in these customized items. We dont think that's being fair to the vendor. If you're not sure about your financial situation or question the look of a customized vehicle, then we'd rather you not order it instead of making us go through the motions and laying out a great deal of money in the process. We're deeply sorry to have to make this decision but the fact of the matter is we can't do business like that, and I dare say most vendors couldn't do business like that.